"If I werent currently looking for a home in one of the most overpriced housing markets in the US, Id be writing a check for the L-509u. Today." Sound "The L-509u was one dead-quiet integrated amp with an ultra-low noise floor, resulting in the blackest of backgrounds from which the music would emerge in solid, focused, three-dimensional images. Additionally, the L-509u was tonally neutral, and did not favor one end of the frequency spectrum over another; instead its sonic signature was geared toward delivering the least-colored, most musically natural performance, regardless of the type of music." "What impressed me most, however, was the L-509us control of the bass." "Subterranean? Without a doubt." Features "Power output is 120 watts into 8 ohms, reportedly doubling to 240 watts into a 4-ohm load.... Frequency response is 20Hz-20kHz for phono (yes, the L-509u has a phono stage, which I wasn't able to test) and 20Hz-100kHz for line-level sources." "One feature of the L-509u is the high-quality electronic input selector switch, taken from Luxmans top-of-the-line C-1000f preamplifier. This results in minimal sound-quality deterioration while increasing channel separation and crosstalk. The L-509u also employs the solid-brass volume control used in the CL-88 vacuum-tube preamplifier." Use "Although Luxman offers remote controls for other products, no remote is supplied for the L-509u, owing to Luxmans insistence on a design with no sonic compromise." Value "The L-509u's true competition is the even more expensive Esoteric A-100 and other cost-no-object integrated amps. Its just that good." Theres a lot to be said for longevity in the business world. It speaks of a commitment to core principles and a focus on quality, with the needs of the consumer kept firmly in sight. When considering the past 20 or so years in the world of high-end audio, quite a few companies have withstood the test of time. However, thinking beyond that time period, the names get fewer: brands such as McIntosh, Audio Research and Klipsch. To those venerable names add Luxman, which has been around for more than 80 years. Few companies of any type have had that kind of staying power. Those that do usually know their target audience well and consistently produce top-flight products. 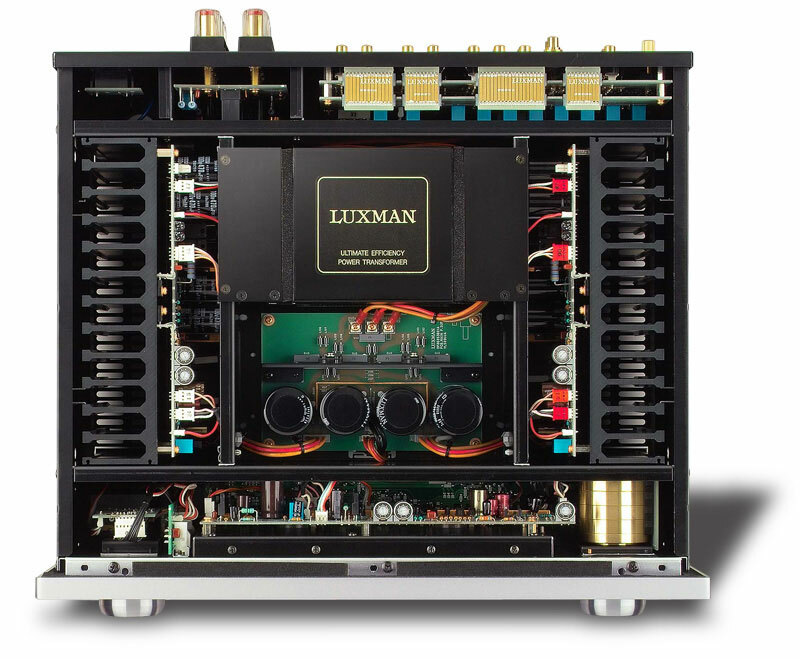 Known mostly for its excellent-sounding tube gear, Luxman also produces well-regarded solid-state electronics. Absent from North America for a number of years following a near-disastrous merger with Alpine Electronics, Luxman is now back on American shores with a full product line of sources, preamps and amplifiers. To that mix, Luxman has added the L-509u solid-state integrated amplifier ($10,000 USD). The L-509u is Luxmans answer to the compromise-is-not-an-option approach to the integrated amplifier, with careful attention paid to all components that would have an effect on sound quality. Made with premium parts to the exacting standards seen in Luxmans entire product line, the L-509u fairly bristles with intelligent details and incorporates some of the best features found in Luxmans preamps and amps. One feature of the L-509u is the high-quality electronic input selector switch, taken from Luxmans top-of-the-line C-1000f preamplifier. This results in minimal sound-quality deterioration while increasing channel separation and crosstalk. The L-509u also employs the solid-brass volume control used in the CL-88 vacuum-tube preamplifier. Additionally, noise and distortion have been kept to a minimum with the introduction of Luxmans Only Distortion Negative Feedback (ODNF) version 2.2. ODNF is a circuit that separates and cancels distorted elements, thereby reducing noise and distortion, again resulting in purer sound. Very handsome in a retro style reminiscent of integrated amps from the '60s and '70s, the L-509u's front panel is dominated by two large VU meters, backlit in baby blue. The front, top, bottom and side panels are made of machined, brushed aluminum, and the top panel is flanked on both sides by black-colored cooling vents. The L-509u measures 18 3/8"W x 7"H x 17"D and weighs 63 pounds. Power output is 120 watts into 8 ohms, reportedly doubling to 240 watts into a 4-ohm load. Total harmonic distortion is rated at a very low 0.003%. Frequency response is 20Hz-20kHz for phono (yes, the L-509u has a phono stage, which I wasn't able to test) and 20Hz-100kHz for line-level sources. The front panel has two large knobs on either side of the VU meters. The right knob adjusts the volume, while the left knob selects among four RCA inputs, two balanced line-level inputs and the phono input, which accommodates moving-magnet or moving-coil cartridges. Adjacent to the input selector are two small buttons; the upper button is for the tape loop, and the lower button selects the moving-coil stage for the phono input. From left to right, in a row along the lower section of the front panel, are the power button, a headphone jack, the record-output selector and a speaker switch for muting (especially helpful when swapping interconnects and cables) or switching between primary and secondary speakers. Continuing further, theres a switch for selecting stereo or mono, and adjustments for bass, treble and balance. The L-509u is unusual in offering tone controls. These used to be standard on preamps and integrated amps, but lately have been left off many leading designs. Poorly designed tone controls may have gotten a bad rap, but, properly implemented, they can be quite helpful in taming edgy treble or muddy bass on poorly engineered recordings. Also on the front panel are three small buttons in a row below the volume control. The first button, Line Straight, is for those who are not interested in the tone controls, allowing their removal from the signal path. The second button, Separate, splits the preamp from the amp, allowing the addition of a room-correction device or a CD player with a digital volume control. The final button switches off the meters' lighting. The rear panel has a signal ground and an RCA input for a turntable. There are four more RCA inputs for various line-level sources along with two more RCA sets of jacks for the tape monitor. Below the RCA jacks are two sets of balanced inputs, both of which come with an ingenious feature. As there are regional differences throughout the world as to pin configuration for both sources and amplification, there is a button between each set of inputs that allows you to invert phase. The speaker binding posts are much like the binding posts that I encountered with the Esoteric A-100 integrated amp, which I reviewed last year. There are two pairs of vertically arrayed, gold-plated, plastic-shrouded posts that accept bare wire, spade lugs and banana plugs. These grasped the spades of my speaker cables tightly and can be manually tightened, no post wrench needed. Rounding out the rear panel is an AC socket for the detachable power cord and the line-phase sensor in the upper right corner. This last feature is clever. Press the button when first setting up the L-509u and the unit will check the phase of the electricity it is receiving. If the AC outlet is wired incorrectly, meaning the live and neutral wires are swapped, a red LED will warn you. Although Luxman offers remote controls for other products, no remote is supplied for the L-509u, owing to Luxmans insistence on a design with no sonic compromise. For me, this was rarely an issue, as I would adjust the volume control at the beginning of an album and leave it at that setting. In fact, the only time that this was even an issue was when listening to the eclectic compilation CDs provided by Luxmans importer, Philip OHanlon of On a Higher Note. Because the tracks were from different artists and albums, recorded at different levels, I had to compensate with some tracks and adjust the volume. No big deal. The unit that had been sent to me by OHanlon had significant use prior to my evaluation; therefore, no burn-in was required and it performed flawlessly with no hiccups. Most of my evaluation was done using the L-509u with the tone controls defeated. I did also, on occasion, take advantage of the line-in option to drive the amplifier section using my Wadia 830 CD players digital volume control (and remote control!). Although the unit never got more than warm, even with extended use at high SPLs, I would still recommend having sufficient airspace over the top to provide adequate ventilation. Like the Esoteric A-100 I reviewed, the L-509u was one dead-quiet integrated amp with an ultra-low noise floor, resulting in the blackest of backgrounds from which the music would emerge in solid, focused, three-dimensional images. Additionally, the L-509u was tonally neutral, and did not favor one end of the frequency spectrum over another; instead its sonic signature was geared toward delivering the least-colored, most musically natural performance, regardless of the type of music. Although a class-AB integrated amp, the L-509u likely runs in class A more than most integrateds at similar power outputs and volumes, resulting in this natural, distortion-free quality. The music was so natural-sounding and involving that I found myself listening more to the music than to the usual recorded artifacts that I often pay attention to when evaluating a component. Its ability to make me forget about what I was doing and just enjoy the music did wonders for increasing sheer musical pleasure, but at the expense of interfering with my ability to focus on and get down to the job at hand: reviewing the thing! Loudspeakers  Wilson Audio Sophia. Integrated amplifier  Jeff Rowland Design Concentra. Digital  Wadia 830 CD player, Logitech Transporter wireless DAC, Apple MacBook with 1TB Apple Time Capsule. Interconnects  Transparent Audio Ultra MusicLink. Speaker cables  Transparent Audio Ultra MusicLink. Headphones and Headphone amplifier  Sennheiser HD 600 headphones, Ultimate Ears UE 11 Pro in-ear monitors, Ray Samuels Audio Emmeline, The Predator headphone amp. Accessories  Audio Power Industries Power Pack II. Dynamically, the L-509u was a solid performer, capable of wide swings in volume with no compression or congestion at louder volumes. A favorite classical recording of mine is of Seiji Ozawa conducting the Boston Symphony Orchestras performance of Stravinskys Petrouchka (BMG Classics 09026-63311-2). This rhythmic, fanfare-like composition is a great workout for integrated amps and can lack coherence when rendered through lesser components. The L-509u handled this composition with aplomb and without any sense of strain, and the transient response, particularly with strings and brass, was fast. With regard to soundstaging, most amplifiers perform best at realistic volumes, with the soundfield collapsing at lower volumes. However, the L-509u delivered soundstaging that was stable, broad and deep, even at low-level SPLs, and blossomed even further when the speakers were given more juice. Very impressive was the reproduction of high frequencies and the midrange. On "Azalea" from trumpeter Brian Lynchs album 24/7 (Nigel Hayer 2055), Lynch solos on his trumpet with the band playing softly behind him, and little details, such as the crisp high hat or the faint brushes on the snare heard in the background, sounded light and delicate, while still remaining detailed. Lynchs playing in the upper register was smooth, airy, and graceful, floating front and center, with no evidence of hardness or edge. The low noise floor of the L-509u again contributed to unveiling this low-level detail. What impressed me most, however, was the L-509us control of the bass. Too often, excellent bass reproduction is attributed solely to the loudspeaker, but the partnering amplifier can have a significant contribution to the bass through its damping factor (in technical terms, the ratio of the impedance of the source to that of the loudspeaker), thereby reducing undesirable movement of the woofer near its resonant frequency. This integrated amp exerts such muscular control over the woofer that the lower frequencies, particularly the deepest octaves, were rendered with power and control. Being nearly full range, my Wilson Audio Sophia speakers have ample bass output, and I was quite confident that over the past four years of ownership, I had experienced their full capabilities. However, listening to "Dead Already" from the American Beauty soundtrack (DreamWorks 450233) was a revelation. This track starts off with what sounds to my ears like a marimba, with more percussion and guitar added as the track progresses. Suddenly, both bass drums and gut-wrenching bass guitar or synthesizer kick in forcefully, with impact that I wasnt prepared for. Although the lowest frequencies rolled off slightly, the depth of bass achieved was startling, with substantial weight and a sustained, room-filling pulse of a quality that I had never heard before with these speakers. Subterranean? Without a doubt. This characteristic was intoxicating and addictive. After hearing this incredible bass response, I dove deep into my collection of rock recordings to exploit and enjoy this quality. The Rolling Stones, the Who, Led Zeppelin? Check. The Grateful Dead, the Allman Brothers Band, Little Feat? Double check. The bass flat out rocked, and I just couldnt get enough. Even so, it wasnt just deep bass that impressed but also the ability to follow individual bass lines. On "Cause Weve Ended As Lovers" from Jeff Becks Live At Ronnie Scotts (Eagle Records ER 20150-2), young bass phenom Tal Wilkenfeld plays sensitively behind Beck as he solos in the beginning of the piece, yet each note can be heard distinctly. As the piece progresses and segues into Wilkenfelds solo, her bass comes to the forefront, every pluck and inflection conveyed perfectly. On more up-tempo cuts, like "Becks Bolero" and "Led Boots," Wilkenfelds bass lines merge more with the rhythm section but continue to provide a solid foundation to the bottom end. I dont spin vinyl, so I didnt have a chance to evaluate the phono section and cant comment on its performance. I did, however, spend time listening to headphones via the L-509u's headphone output. This is no thrown-in feature. The L-509u was able to drive both my Sennheiser HD 600 headphones and Ultimate Ears UE 11 Pro in-ear monitors effortlessly, coming in handy for early-morning and late-night listening sessions while my family was sleeping. This feature is significant. It eliminates the need for a dedicated headphone amp. The most striking difference between the L-509u and my Jeff Rowland Concentra ($5600 when still available) was with the bass reproduction. Tonally, they are quite similar -- uncolored and musically natural -- but with regard to the control of the woofer and the ultimate low-frequency extension, the Concentra was no match. My current room is compromised in the bass department because of it small volume, so I still experience some bass overhang with the Concentra, especially at louder volumes. The extraordinary control of the L-509u made it seem as if I had a subwoofer in my system, and yet the problems with overhang were largely eliminated. The treble and midrange were very comparable between the two integrateds. However, the lower noise floor of the L-509u allowed more detail to emerge within these frequency ranges, particularly in quiet interludes that otherwise would have been somewhat veiled with the Concentra. Dynamically, the L-509u brings more power to the table, enabling it to offer much better transient response thats especially noticeable with symphonic music. The L-509u's true competition is the even more expensive Esoteric A-100 and other cost-no-object integrated amps. Its just that good. The Luxman L-509u is a versatile, full-featured integrated amplifier, complete with a MM/MC phono section and a headphone output, and it offers sonic performance that easily outclasses my current reference. It may cost almost twice as much, but, to me, its features and performance easily justify the added expense. If I werent currently looking for a home in one of the most overpriced housing markets in the US, Id be writing a check for the L-509u. Today.